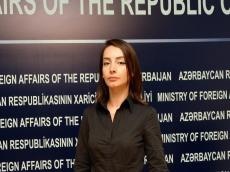 Leyla Abdullayeva noted that Azerbaijan understands the interest of the Russian Foreign Minister in matters related to the detention of his country’s citizens. "At the same time, we expect special attention and increased efforts to return Dilgam Asgarov, who is a Russian citizen taken hostage in the occupied territories of Azerbaijan and sentenced to life imprisonment by a separatist court," said the spokesman for the Foreign Ministry. Sergey Lavrov, in response to a question related to the detention of a Russian citizen of Armenian origin in Azerbaijan, said “he hopes that by making decisions based on dialogue and legal norms, it will be possible to achieve results that will satisfy everyone and that citizen will be returned”.